Whether you’re a freshwater angler or a saltwater sailor, there are few places you’d rather be than cruising the open water with a fishing buddy, a first mate, or a band of scurvy misfits. The boating life isn’t allfun in the sun. You’ve got nautical skills to master, laws to abide by, and safety precautions to follow. With all that to worry about, you don’t need the added task of finding the right boat insurance on your own. Our independent insurance agents know the ins and outs of boat insurance and will walk you through your options to make sure you and your boat have the proper coverage. Boating insurance needs will vary for every skipper, vessel and state. Some coverage options may not be required, or seem a little over the top to you, but sometimes the smallest circumstances can create the biggest impact. Captain’s oopsies:A collision or grounding that ruins your boat and all its gear. The sea’s wrath: A hurricane or lightning sinks your craft. Pirates: Your boat is stolen with all its fishing rods, stereo equipment, etc. Bodily injury liability: For any medical-related expenses for another person. Property damage liability: For expenses for damaging another’s property. Physical damage: For expenses due to damage to your own property, trailer, etc. Property coverage: For tools, life preservers, anchors, and even fishing gear. Towing coverage: For when your boat becomes disabled. Medical expenses: For hospital and funeral expenses for you or your passengers. Uninsured/underinsured boaters’ coverage: If you have an accident with another boater whose insurance is not sufficient to cover damages. What Kind of Boats Need To Be Insured? Yacht or naught, all boats should carry some form of coverage. After all, you never know when your vessel could be damaged, stolen or involved in an accident that results in injury. Even if your boat is docked or stored, it can be vandalized, damaged in a fire or storm, or even stolen. Fun fact: Small watercraft such as canoes, rafts and kayaks may be covered under your homeowners or renter’s insurance policy. Fun fact disclaimer: Make sure to work with an independent insurance agent to find the proper protection. If claim time comes, you wouldn’t want to run into coverage issues, leaving you with out-of-pocket expenses. Take the time to think about how much coverage you would need to repair or replace your fleet in the event of damage or theft. On average, boat insurance costs between $300 and $500 annually, but it can run over $1,000 per year depending on the type of boat, your personal profile, and a few other factors. Boat usage: If you only take your boat out on occasional fishingtrips, your rates will typically be lower than if you tow water skiers, wake boarders or parasailers. Driving record: Good auto drivers tend to be good boat drivers. Past boat insurance claims: You may have to pay more if you’ve filed many claims in the past. Other insured’s experience: Adding your teenage son as a driver on your policy may increase your rates. Safety measures: Have you had a certified safety course? Do you have Coast Guard-approved fire extinguishers and radios to communicate with the mainland? Horsepower of the boat: Often, boats with a higher horsepower engine will have higher insurance premiums. Your gender and age: Women over 27 have been found to receive better rates than their male counterparts. Specs of your boat: Year, make and model of the boat and motor, and whether you have an inboard or outboard motor, come in to play when determining rates. Region of the country: Will you be using the boat in areas where there are natural hazards like hurricanes? 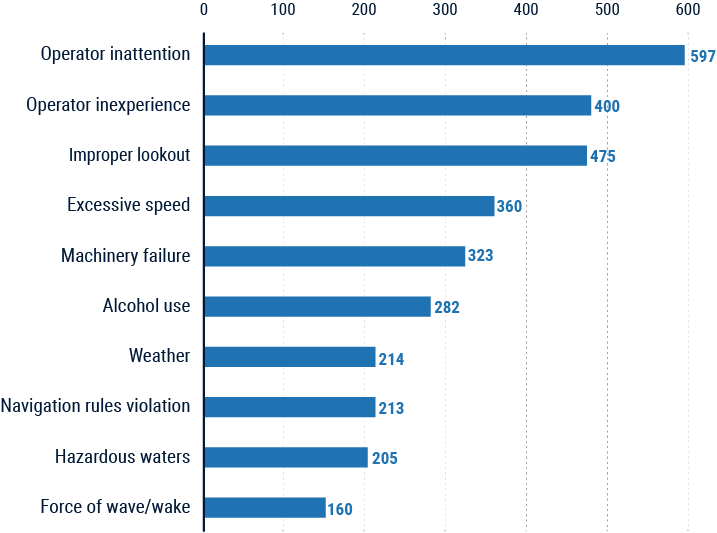 Your credit score: Believe it or not, insurance companies have found that a person with a lower credit score is statistically more prone to boating accidents. Sure, the cost of your policy may not be in your control, but we’ve got a pro tip to help you lower it. It’s a little something called bundling. In most cases, you can actually bundle your boat policy with your auto policy to receive a nice little discount. Consolidating your policies within one agency will definitely help save you a fair amount, not to mention make it easier to manage it all during the claim process. So talk to your independent insurance agent and let them help guide you to where you want to go. We know what you’re really looking for — fast and easy boat insurance quotes in 30 seconds or less. We get it, you want the goods ASAP, but choosing speed over accuracy can wind up costing you. Robots and algorithms may be quick, but online companies might leave out cost-cutting options or leave in factors that assume higher risk, resulting in a pricier policy. Not only that, our competitors may sell your info to multiple companies, which can result in calls, on calls, on calls. We flipped the script on this process and give YOU the info and options to connect with an independent agent. Independent insurance agents will walk you through a handpicked selection of policies from all the best boat and yacht insurance companies. Not only that, they’ll cut the jargon and clarify the fine print, so you know exactly what you’re getting.